Successful mission-driven organizations artfully articulate impact to a variety of audiences. And they are often “multilingual” in doing so, because with varied listeners comes a need to speak multiple impact languages by using the right social impact metrics. The key to achieving proficiency in that journey is first to understand which impact language will best serve your needs and those of your audience. In this blog, we'll take you through the four essential steps to get relevant and actionable metrics for your organization. Are there standards you want to align with? So if you're wondering what metrics you should be using to measure your impact, or if your current metrics are really what you should be using, or even if you're simply curious about the selection process -- this blog we'll clarify that journey. By now you have (hopefully!) read the two previous introductory blogs in this series on Actionable Impact Management. The first outlined some clear, yet nuanced reasons about the value of social impact measurement. The second gave an overview of Actionable Impact Management and explored some of the ground work involved. Now, we’ll take a look at the first step following that Groundwork: Metrics discovery. How can you choose the right social impact metrics? Should you align with the Sustainable Development Goals (SDG Indicators) or use non-profit systems like Guidestar Metrics or Guidestar Platinum Metrics? What about impact investing metrics? Or something else entirely? The metrics package you build must speak as loudly as the impact you create. This blog will use Aravind Eye Care System as a case study to demonstrate how the metrics discovery phase can be applied. Aravind is a chain of hospitals in India with a mission to eliminate needless blindness. We will focus on Aravind’s eye surgery service, which uses a cross-subsidy model to make surgeries and eye care accessible to those who could otherwise not afford it. What metrics might Aravind use for demonstrating impact, and how might they determine which metrics to choose? Let’s take a look. Ultimately, your impact reporting should be driven by a desire to stay true to mission, to the overarching why of what you do. But embedded within that is a deeper strategy with layers of multiple objectives. One of those objectives: to communicate impact to a certain audience. Consider Aravind in its early stages and let’s assume they wanted to attract capital from impact investors who had a desire to invest within the health sector. Which metrics language might speak to this audience most effectively? To answer this question Aravind could engage investor networks, research similar use cases, or tap into other existing resources. The purpose of this is to make sure they have a clear communication strategy aligned with an impact measurement process. This will help determine whether they will want to align with a particular standard (choosing which one will come later). Of course, Aravind will likely have multiple stakeholders for whom they want to communicate impact. Different metric sets may be appropriate, especially for different programs. In the end, understanding the who lays the groundwork for determining which aspects of programming to target in an impact measurement strategy. How will you Measure Social Impact? You’ve identified a certain audience or audiences. Now it is time to identify which aspects of your program(s) are most critical to conveying an impact message that is relevant for them. Put simply, focusing on measuring what matters. If that seems obvious it’s because it is. But it is relevant because we don’t always adhere to that simple adage. Financial constraints, knowledge gaps, time scarcity -- there are a number of reasons why we might feel pressured to choose faster, cheaper, and easier impact measurement strategies. In the case of Aravind, their “easy” tracking likely involves administrative outputs like number of hospitals built or surgeons employed. A new impact measurement process does not need to be implemented to gather, track or report such data. And yet, these are simple, structural measures describing the attributes of their health care system -- superficial proxies that do not realistically communicate impact nor causality. Instead, Aravind could dig deeper into their surgery program for relevant process-related outputs (e.g. how many patients received successful surgeries) as well as outcomes measuring changes in the lives of surgery recipients. For example, they could measure what percentage of patients regained employment after successful surgical treatment and follow-up. Thus, in this step it is best to start by outlining aspects of your program(s) that you think will need to be measured. And without the help of a standard catalog, brainstorm metrics you think make sense for capturing and communicating impact in these areas. Then explore if there is any alignment with appropriate existing standards (e.g. for impact investors). The follow graphic facilitates finding metrics alignment for your specific strategy. Global Goals United Nations Sustainable Development Goals (SDGs). Community (Non Profit); Guidestar, Robinhood, etc. Domain Specific HP2020 (Health), WASH (Water, Sanitation, & Hygiene), etc. Custom Metrics If you need to fill in any gaps not covered by existing standards. Read More: How to go beyond IRIS metrics while choosing your social impact metrics? These steps are made much easier if you have done your due diligence and completed Groundwork, including a thoughtful Theory of Change model and a detailed programming structure outline. Notice that Metric 1 uses a standard metric from the IRIS catalog, which is used to measure impact investment returns. In this way, Aravind can speak the language of potential impact investors. Metric 2 (Aravind actually used this in a study they conducted) may speak to some investors as well, although it is not aligned with a returns standard in this case. You can also see a narrative-based metric in this list. Aravind could include this if they want to leverage impact narratives in marketing materials or other less data-inclined audiences. The more impact languages you speak, the more accessible your impact reporting becomes to diverse audiences. As a last note, it is important at this stage to engage stakeholders who might be affected by your budding social impact measurement plans. Do your beneficiaries believe your metrics are relevant? How does your organization perceive its capacity to implement? Can you realistically acquire such data? These conversations and the other steps in the metrics discovery phase will support later stages of the impact reporting process. As you move into data collection strategies (step 2 of Actionable Impact Management) you can refer back to this foundation to see which metrics might be derived from existing administrative data, and which need new processes implemented. Read More: What you should know about Standardized Social Impact Metrics? While engaging in metrics discovery and in referring back to earlier Pre-work stages, you’ll realize this is an iterative process. What is most critical is that your impact measurement communicates outcomes which demonstrate that you affected change. Because metrics discovery is ultimately a roadmap of accountability, both to your mission and to your beneficiaries. If you stay flexible, keep mission in mind, and empower your stakeholders to guide you, your next impact report will speak loudly and proudly to the audience who needs to hear it most. As with any conversation, if you can communicate with authenticity and a shared language, your message will be heard, and your audience moved to engage. Read More: Is Measuring Impact Worth the Financial Strain? Or More resources on Social Impact Metrics. Intrigued about how to put these thoughts into action? Schedule to see our Impact Cloud and experience how a 2500+ metrics catalogue can help in your metrics selection process. You can then run your metrics through a checklist like the one below. This will help you think through whether or not they are necessary or worth measuring (i.e. mission critical and realistic). 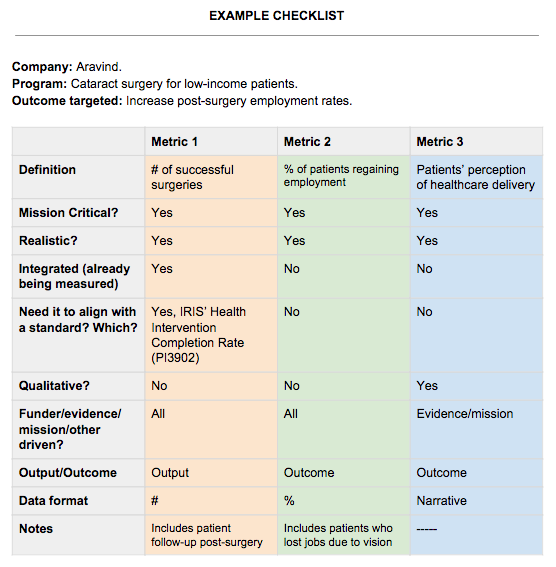 In the example checklist we continue to use the surgery program area, but have narrowed down the programming to be specific to low-income patients. We have also targeted a specific outcome for this metric set.